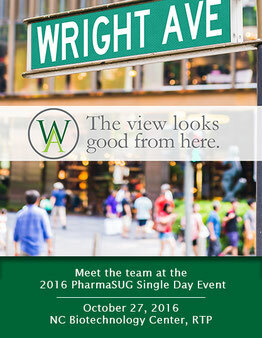 Join Wright Avenue's Director of Statistical Programming and Technology, Mike Molter and team at the 2016 PharmaSUG Single Day Event on October 27, 2016. Have some food, fun and get your CDISC grab bag at the N.C. Biotechnology Center in RTP, NC while experiencing a full day of CDISC content from industry experts. Don't miss Mike's Presentation, My Attempt to Rid the Clinical World of Excel, at 1:45 p.m. and be sure to connect with us at the Wright Avenue Sponsor Booth #7 to learn about new paths of career opportunities. To schedule a meeting, email us at careers@wrightave.com. Click here for more information on PharmaSUG SDE RTP 2016. Click here for directions to the North Carolina Biotechnology Center.